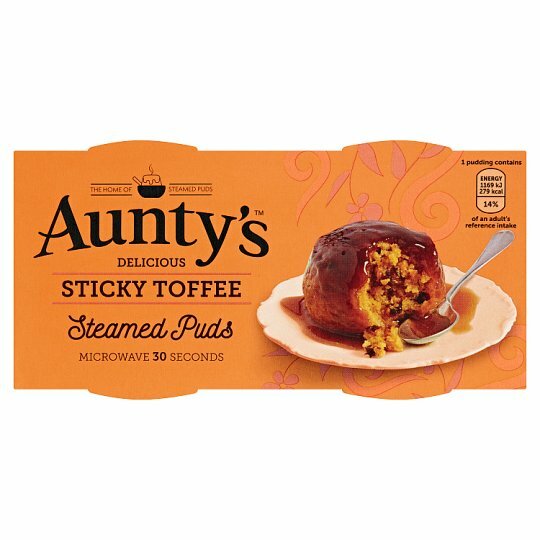 At Aunty's we are proud of our puds, all of them are made to our own unique recipes. They are steamed in time honoured traditional way and not baked, giving Aunty's puds a moist and delicious home made taste. Using only natural colours and flavours they are perfect on their own, or the ideal partner for some fruit, cream or ice cream. Why not come home to your favourite today. Cooking Instructions (General): Caution: Pudding will be hot and steamy. Microwave (From Ambient): Peel off foil. Heat each pudding for 30-40 seconds on high (based on 900W oven). Adjust time to suit your own oven. Flip onto plate, squeeze, remove pot and enjoy. Steam (From Ambient): Pierce foil and steam for 25 minutes. We stand by the quality of our products, if you have any queries please let us know. CAUTION: PUDDING MAY CONTAIN DATE PITS.